When you work with or around any chemical, you need to know how to protect yourself from its hazards. For most chemicals, this means wearing the proper personal protective equipment (PPE). PPE can include goggles and full face masks, protective footwear, coveralls and aprons, hoods and other head protection, and gloves. But just because a glove fits does not mean it’s the right fit for the job. Before working with a particular chemical, check out Section 8 in the Safety Data Sheet – the section that describes the proper PPE for that chemical. Section 8 helps you match the glove to the hazard. For instance, Section 8 in the SDS for a corrosive reactivating solvent tells you what kind of gloves to wear. 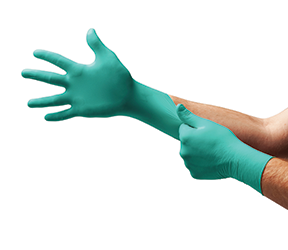 Hand protection: It is recommended that chemical-resistant, impervious gloves are worn. Consult the glove supplier or manufacturer to choose the most suitable glove. Gloves should be chosen based on the breakthrough time of the glove material. Change gloves frequently when working with this chemical. Recommended materials for gloves are: Butyl rubber. Nitrile rubber. Rubber (natural, latex). Obviously, you don’t want to wear cloth gloves, or other materials that will allow the solvent through. You need a solid protective barrier between you and the chemical hazard. And even though the SDS says to choose a rubber glove, you probably don’t want to choose a glove made of thin rubber, which has a faster “breakthrough” time than a thicker glove. Your employer should work with the glove supplier to ensure you have the proper glove to match to the chemical, and that you have enough gloves available to change them often. Other gloves are made of materials that can protect against hazards from hot work, cold work, cuts, punctures, and so on. Finally, make sure the glove itself does not create a hazard. Gloves should fit snugly, but not too tightly. When glove use is required around machinery, they must fit tightly so they don’t snag on moving parts. Hazardous jobs: Can a worker refuse? This article was featured in the HazSafety Training Advisor Newsletter. The HazSafety Training Advisor newsletter helps you increase your employees' awareness of regulations, processes, and best practices related to Hazmat, HazCom, HazWaste, and HAZWOPER. Click here to sample this newsletter for free.